Compare Asbury Park today to the postcards of 1888, when the Palace first opened, and you'll find virtually nothing from then, except the street grid laid out by Asbury's founder, James A. Bradley. That's a tragedy for Asbury Park, because at the very time the city was struggling to regain its footing after a long decline, renovated historic places were becoming a very big deal. According to a New Jersey State study, tourists stayed longer and spent more at renovated historic sites than they did anywhere else. The study also showed that developers who renovated historic buildings cut costs, created more jobs, and pumped more money into the local economy than by constructing anew. Even the federal government was helping, by offering a tax credit to defray the cost of renovating buildings on the National Register of Historic Places, such as the Palace. From 1984 through 1997, the City of Asbury Park's waterfront plan called for a revitalized housing and entertainment zone near the ocean. The plan marked many waterfront buildings for demolition, but not the Palace. The Palace was in a special category of buildings designated for renovation and reuse. Even after 1988, when the Palace closed, the master plan continued to call for an entertainment zone at the Palace and the Casino. On May 21, 1991, the City signed an agreement with waterfront developer and the new Palace owner Joseph Carabetta to transform the entire "Palace block" into a "family amusement facility." Then the storm clouds blew in. Carabetta's construction business in New England went belly up, and the ripple effects brought work on the Asbury waterfront to a screeching halt. For the next decade, the waterfront stagnated, setting the stage for a City Council election that produced a Council whose members promised to get the project going again. That was not to be. Several new Council members saw the waterfront as an avenue toward personal enrichment. Their dealings with developers led Mayor Kenneth "Butch" Saunders (tax evasion) and Councilman James Condos (mail fraud) to federal convictions, based in part on secretly made tape recordings by a third council member, while a fourth member was barred by conflicts of interest from voting on most waterfront issues. Into this mix came Save Tillie, a new preservation organization comprised of Bruce Springsteen fans, amusement park fans, and friends of Asbury Park. It formed in July of 1998 when an interior mezzanine overhanging the Skooter room at the Palace collapsed and city officials launched a campaign to pressure Carabetta into demolishing the Palace. Save Tillie initially stood for rescuing Tillie, the iconic mural painted by Worth Thomas, at the time of demolition, but later expanded its goals to include renovation of the entire complex. Removal of the Bumper Car mural by Universal Fabricators, Jackson, NJ (June 2004). Photo copyrighted by Carl Beams. The more than 1,000 Save Tillie members (nearly all from outside Asbury Park) spent six years actively involved in Asbury Park. During that time, Save Tillie members provide new furniture to the Boys and Girls Club, provided books to the Asbury Park High School Library, supported activities of the Asbury Park Historical Association, spent hundreds of hours cleaning the streets and sidewalks around the Palace as part of Councilwoman Mellina's Asbury cleanup campaign, made financial donations to the Center of Asbury Park and to the Asbury Park Homeowners Association scholarship fund, created and sent a historic preservation mailing to every Asbury Park household, and convinced the U.S. 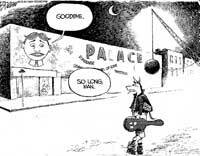 Postal Service to honor Asbury Park by issuing a Tillie pictorial postmark, only, in the end, to have the Asbury Partners - McGreevey partnership pull the welcoming mat out from under them.